While bushwacking up above the Camel’s Hump Nordic trails today, I came across several trout lilies in full bloom. Kneeling down to get a good shot, I noticed this congregation of false blister beetles feeding on the pollen and mating. According to Mary Holland’s excellent “Naturally Curious Day By Day”, these beetles are commonly found on trout lilies (the lilies being one of the early spring ephemerals) where they eat and do their business pretty much at the same time. Panasonic GX8, Olympus 60mm macro, ISO 800, f/11, 1/160″ exposure. This little solitary bee was diligently gathering pollen on a rough-fruited cinquefoil blossom in our front field. I love the detail revealed at the center of the flower. Panasonic GX8, Olympus 60mm macro lens, ISO 800, f/8, 1/800″ exposure. Hummingbird moths are wonderfully surprising insects. The first time I saw one many years ago, I had no idea what I was looking at. It moved like a hummingbird, but obviously wasn’t one. Nor was it a large bumble bee. There are two varieties of hummingbird moth common to North America—the Snowberry Clearwing and the Hummingbird Clearwing (pictured above). The reddish coloration is a clear indication of the latter. This little guy was quite busy at the azalea blooming by our kitchen window. Panasonic GX8, Lumix 24-140mm lens @ 61mm, ISO 800, f/8, 1/2000″ exposure. 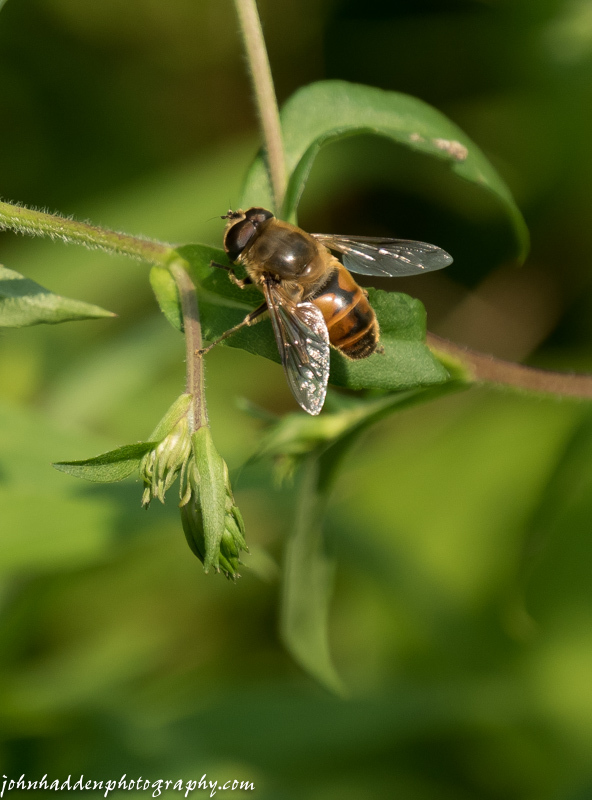 A hover fly pauses briefly in our front field. Thanks for the ID Everett! Panasonic Lumix GM5, Lumix 14-140mm lens @ 140mm, ISO 200, f/5.6, 1/250″ exposure. 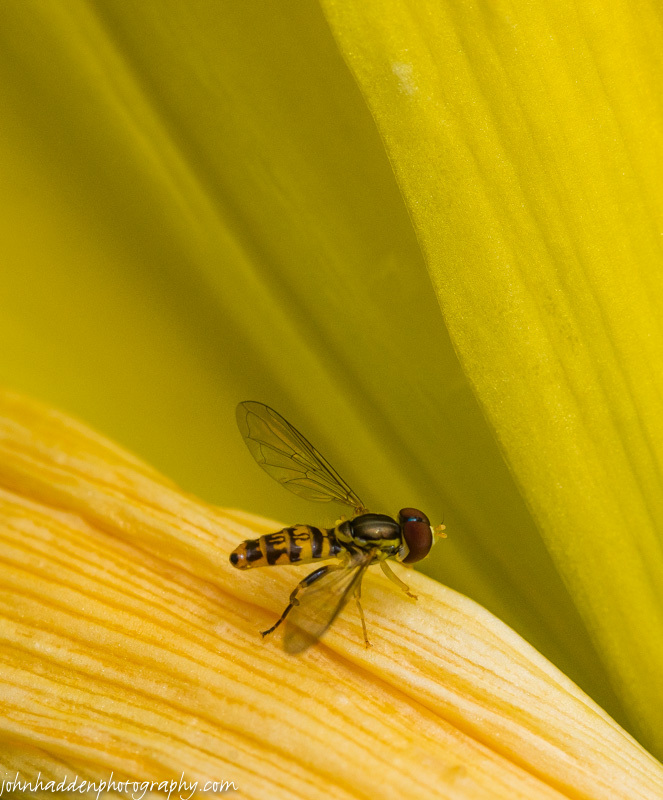 Up close with a tachina fly living in a yellow world. Nikon D600, Sigma 105mm macro, ISO 800, f/13, 1/1600″ exposure.